The most notorious and best remembered of all [the gales on the Yorkshire coast] was undoubtedly that of 10 February 1871 when a hundred ships were wrecked on the coast, including thirty in Bridlington Bay where an estimated seventy lives were lost. The winter of 1870-71 had been particularly bad, and a vast fleet of colliers had sheltered in the Tyne waiting for a break in the weather. Their chance came on 9 February when approximately 400 vessels made sail, many of them bound for Paris which was under German siege at this time. As the fleet reached Bridlington Bay the breeze died away and many of the vessels anchored offshore to await a favourable wind. However, it never came; a south-easterly gale accompanied by heavy sleet and snow sprang up early on the morning of 10 February. The local rocket apparatus, and Bridlington's two lifeboats, waited in readiness for the inevitable disasters. Samuel Plimsoll, who was at this time campaigning for safety regulations for the protection of seamen, used the 1871 disaster at Bridlington as evidence for the great need to control safety in ships. …By noon the crews of both life-boats were exhausted but much work remained to be done as many vessels were in difficulties. One crew member in the "Harbinger" was so weakened by the constant rowing back and forth to rescue more sailors that he had to be lifted out of the boat. His place was taken by David Purdon, the builder of the boat, which then proceeded to rescue the crew of a brig stranded on the south beach. It was then noticed that a brig - the "Delta" of Whitby - was in danger of breaking up south of the harbour. Four of her crew launched one of the ship's boats and attempted to reach the shore but unfortunately it was swamped by a terrific wave and all were drowned. However it was noticed that the Captain was still clinging to the doomed ship and the crew of the "Harbinger" made another attempt to rescue him. The little boat passed the south pier, one minute on the crest of a mighty wave and the next into the depth. At last they reached the stern of the vessel where the Captain was hanging on. Having steered the boat up close the Coxwain shouted to the man to watch out and immediately after the next wave had passed to jump onto the boat. Unfortunately the next wave was the last for some of them. Rising with terrific force it took the boat high up on the crest and then plunged it down foremost into the sea. Straight away it righted itself and three of the crew were hanging onto the ropes along the sides, eventually being saved when the boat was swept ashore by the heavy seas. Unfortunately six of the life-boat's crew plus the Captain of the brig were lost. The first lifeboat was purchased in 1306, by subscription; and in 1866 it was replaced by one named "John William and Francis," presented by R. Whitworth, Esq., of Manchester, and placed under the management of the Royal National Lifeboat Institution. Shortly afterwards Count Batthyany presented one of a different design, and named "The Harbinger," to the Committee of the Sailors' and Working Men's Club. On the 10th of February, 1871, there occurred a storm of almost unprecedented fury, when more than 20 vessels were wrecked in the bay, and more than 50 lives lost almost within reach of the shore. Both boats did good service, notably "The Harbinger," and were the means of saving many lives that must otherwise have been lost. "The Harbinger" had at last the misfortune to capsize, and six out of the nine brave fellows that manned it were drowned. Many attributed the disaster to the build of the boat, and the Rev. 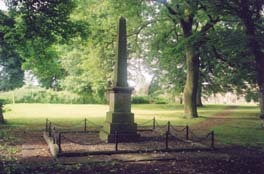 Y. Lloyd Greame, of Sewerby House, with his usual sympathy and generosity, undertook to provide one that should be built in accordance with the ideas of the fishermen of the place. This boat is named "The Sea Gull," and is under the management of the Committee of the Sailors' and Working Men's Club. It is kept in a house in Cliff Street, built at the expense of the same Rev, gentleman. "The Harbinger," for which no boathouse was provided, is worn out with exposure to the weather. and an unknown English Schooner were wrecked on the 10th February 1871 with the loss of life in Bridlington Bay. Thirteen other vessels were lost in the Bay in the same Gale. 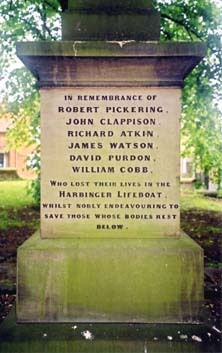 In memory of DAVID PURDON of Bridlington Quay who nobly sacrificed his life in attempting to save the crew of the brig Delta of Whitby February 10th 1871 Aged 38 years. Also Harriet, relict of the above named who died on April 9 1871 aged 29 years. It is not for sale or general publication.